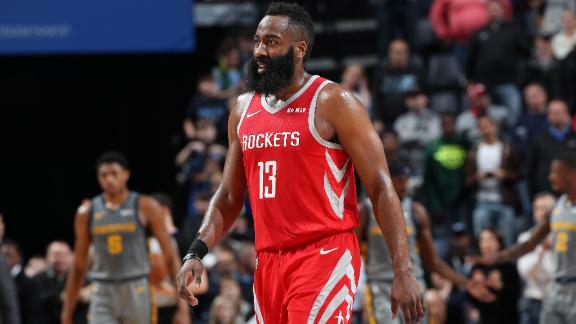 MEMPHIS, Tenn. -- James Harden did everything he could to bring the Houston Rockets back from a big deficit in the fourth quarter. He got them to overtime, but his 57 points weren't enough. Mike Conley scored 35 points and Jonas Valanciunas had a career-best 33, including the game-winning free throw with less than a second left as the Memphis Grizzlies outlasted the Rockets 126-125 on Wednesday night. Harden led a 17-2 Houston rally in the fourth -- scoring 15 points during that stretch -- to pull the Rockets to 106-104. He hit three free throws with 4 seconds remaining to send the game to overtime tied at 115. Harden scored all 10 points for Houston in overtime, and the teams were still tied at 125 when Clint Capela fouled Valanciunas with 0.1 seconds left. Valanciunas, who also had 15 rebounds, made the first of two free throws. The clock ran out after he missed the second foul shot. Harden had previously scored 57 against the Grizzlies on Jan. 14. He's the third player to record multiple 50-point games against one opponent in a season over the past 30 seasons, joining Kobe Bryant and Michael Jordan. Memphis dominated the game through 3 quarters until the Harden-led comeback. Conley made all six of his shots, including a quartet of 3-pointers, in the first quarter. Valanciunas made all nine of his shots in the first half. Rockets: Harden's 57 points were just short of his career-best 61 against the Knicks on Jan. 23. ...Eric Gordon (rest) was given the night off, and Kenneth Faried sat out with left knee soreness. ... Harden's streak of five straight double-doubles ended. ... Houston made 21 3-pointers, the most by a Memphis opponent this season and second-most in Grizzlies franchise history (23 by the Pistons on April 8, 2018). The win was Memphis' fourth in the last six games -- three of the four against teams in the Western Conference playoff race. The fourth was over Orlando, which is just outside the postseason picture in the East. "It's not like, 'Oh, they're a playoff team, we want to play better,''' Grizzlies guard Delon Wright said. "We're just trying to win every game. It just so happens that we're beating the playoff teams." James Harden's 57 points weren't enough for the Rockets in a 126-125 overtime loss to the Grizzlies.